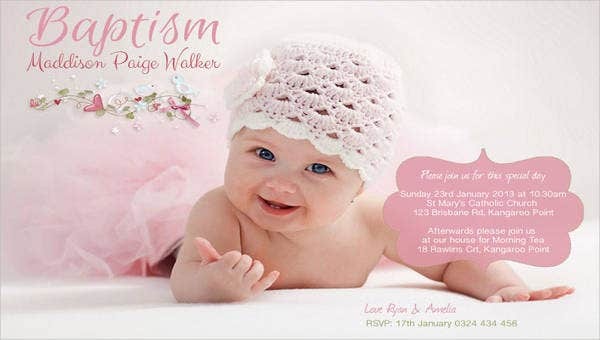 A christening is a ceremony of baptism, especially as guided by the giving of a name to a child. It is also a start of a wonderful journey of faith to a child and an important day for all your friends and family as well. 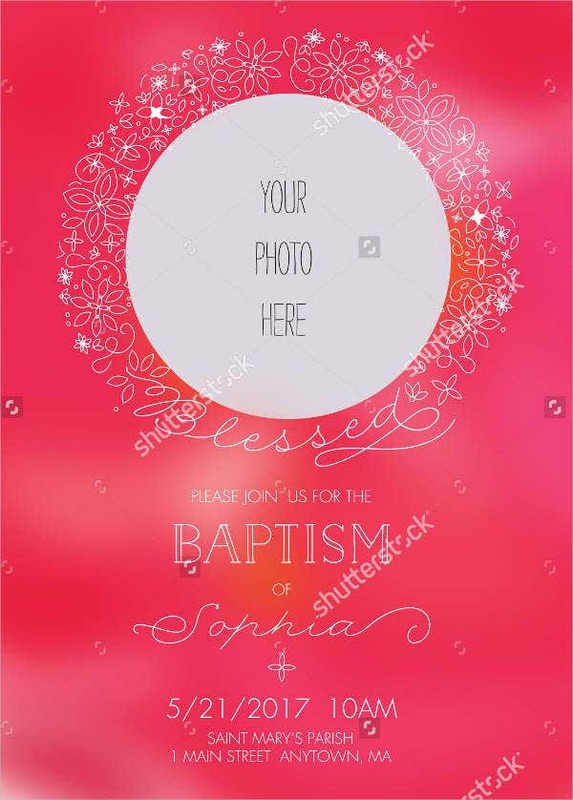 During a christening, a child will be baptized with a use of a water, and some may happen inside a church, beach, or pool, depending on the belief. If you are planning for this type of event and yet you can’t find any appropriate designs for your invitations, well, no need to worry. 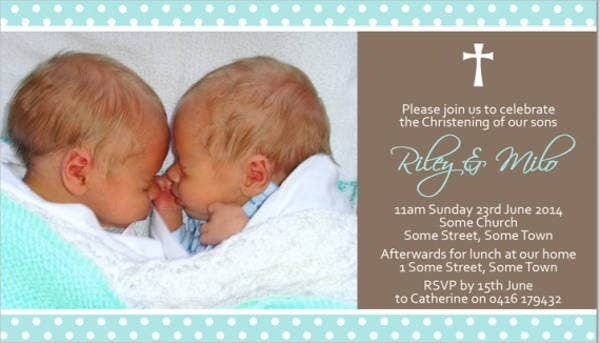 Our christening photo invitations or Baptism Invitation Templates will do the thing. These are made by our talented designers. For sure you will like them. Go ahead and take a look. 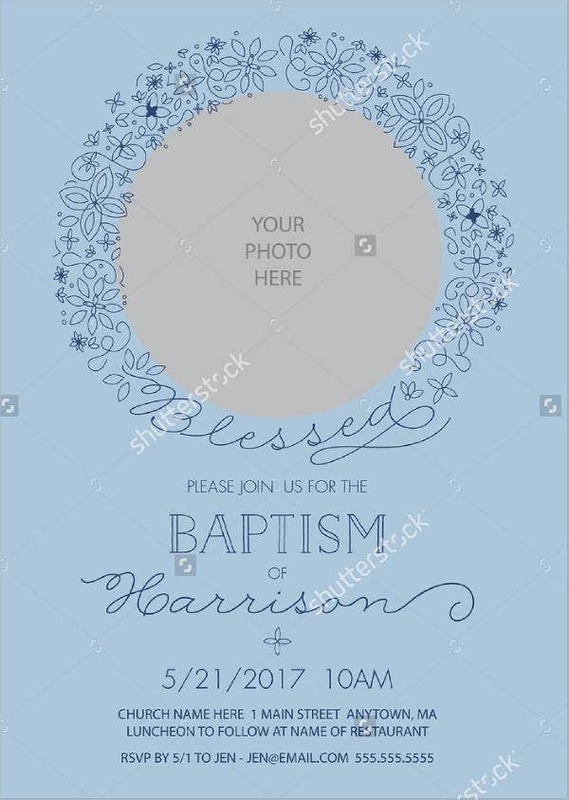 The English term baptism is derived obliquely through Latin from the Greek idea noun which is baptisma (Greek for “washing”). As the Catholic Church grew, we saw baby baptisms as rising as a worldwide tradition. This is based upon the fact that even in the archaic church, there was the idea that christening was the inception ceremony into the community of faith, and babies are born into that community. A second known factor is that baptism can wash away the blemish of original sin, according to Christian beliefs. In Christianity, baptism or christening is one of two ordinances that Jesus created for the church. “Go and make disciples of all nations, baptizing them in the name of the Father and of the Son and of the Holy Spirit, and teaching them to obey all I have commanded you. And surely I am with you always, to the very end of the age,” as Matthew 28:19-20 says. This is what Jesus said right before He ascended into heaven. The guidance cited that the church is in charge to teach Jesus’s word to create disciples and baptize those disciples. Jesus commanded it, so that’s the reason it is necessary. Up until now, this practice is still a part of Christianity and forever will be. Looking for birthday designs? 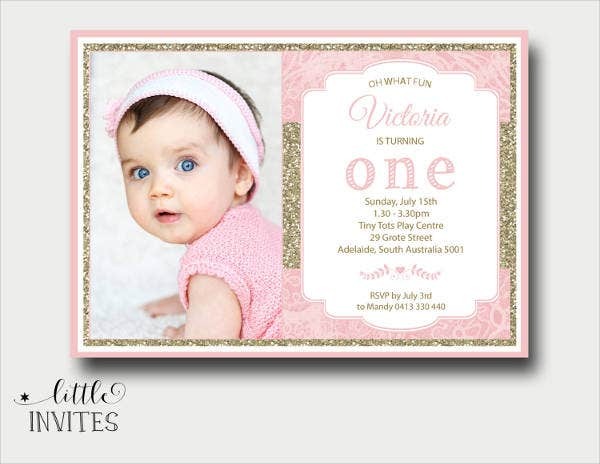 Go to our Photo Birthday Invitation Templates page. Christening or baptism shows a believer’s description with Jesus’s death, burial, and resurrection. All throughout the gospel is Jesus Christ’s life recorded and people are drawn to faith in Christ which means they are to be baptized. Accepting Jesus Christ into one’s life is the most compelling process a person can ever do. It is a very glorious moment to be able to accept and trust Christ as Savior and Lord. He comes and inhabits the new believer, and a wonderful, eternal adventure starts. 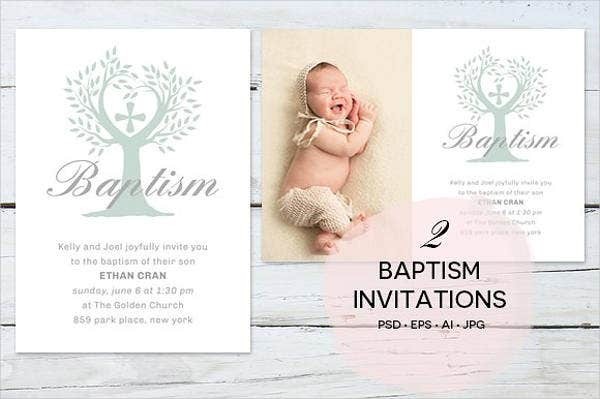 Now, since we are talking about baptism or christening, we all know that among the celebrations that we know, this is one of the cutest and sweetest parties we encounter. 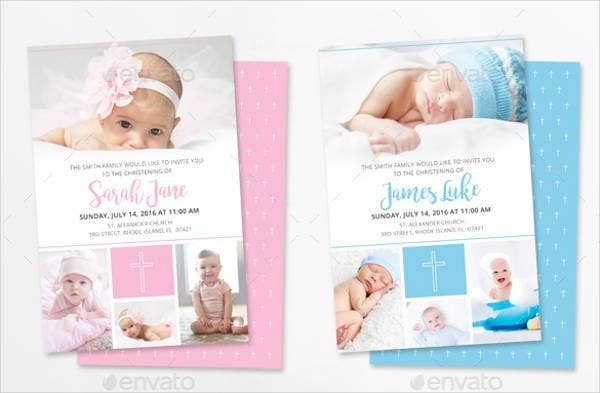 If you are preparing for a baby shower and you are still looking for a perfect design for your invitations, worry no more. With our wonderful collection, for sure you will love it. An invitation does not need to be plain and simple as you may add a little twist to it so that guests will also be excited and will look forward to the event. Make it catchy and more personalized—that way, guests will also notice your creativity. The designs that we offer are indeed fantastic and one of a kind, and apart from that, you can edit them and are downloadable to any device anytime and anywhere. 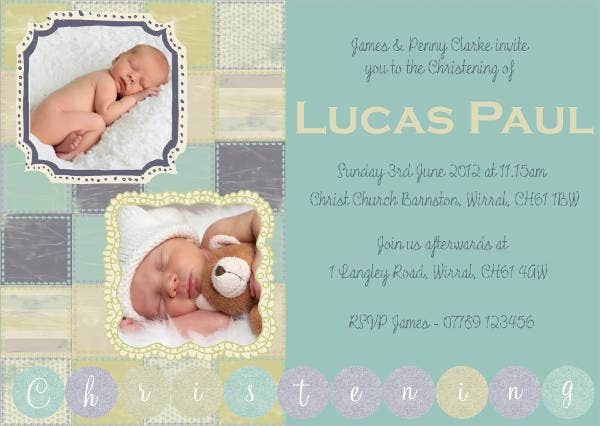 You may also check our Formal Invitation Templates.